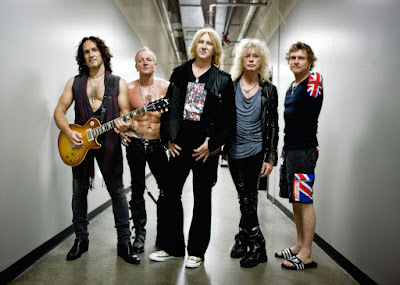 Def Leppard are streaming a new holiday single, “We All Need Christmas”, as a preview to the November 30 release of a greatest-hits collection entitled "The Story So Far - The Best Of Def Leppard." The compilation will be available in multiple configurations, including a 2-CD set comprised of 35 tracks, a single CD edition featuring 17 tracks, 2-LP vinyl, and digital (see song list below). November 30 will also see Def Leppard release a 10-disc limited-edition vinyl box set called "Hysteria: The Singles." Featuring all of the seven-inch singles from the band’s 1987 multi-platinum album – which celebrated its 30th anniversary last year – the package delivers re-pressed versions of all eight seven-inch vinyl singles, including the Top 5 hits "Pour Some Sugar On Me", "Animal", "Love Bites", "Hysteria", "Rocket" and "Armageddon It." Two bonus singles – "Excitable"/"Run Riot" (Album Version) and "Love And Affection"/"Don't Shoot The Shotgun" (Album Version) – are exclusive to the vinyl box set.